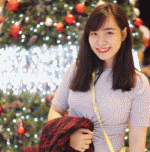 Hey Guys, I am teacher Phuong who is now living in Canada. I’ve got Master of TESOL in Australia and two Bachelors of Arts, majoring in International Relations and English Language. Previously, I was a Deputy Director of the Foreign Languages and Informatics Center at Ba Ria – Vung Tau University. I have been teaching English for Tourism, Business and EFL in university for 11 years. I used to work at ILA Vietnam and experienced in teaching English for Children. Furthermore, I have worked as a tutorial for those who wish to take IELTS and TOEFL iBT to study abroad. Some of my previous students are now studying in the US and Canada. I love teaching English. It’s not only my professional but also my interest. I am keen on supporting learners to enhance their language acquisition, motivate their strength development, overwhelm their weaknesses and encourage their skill of public speaking. Learning English in my class will be excited and enjoyable and you can practice what you learned to satisfy your practical benefits. However, I highly appreciate your cooperation in interacting with me to assure what has been done in class must be ascertained. Enjoy funny classes with me to make English language easier. Hope to see you soon online. Have a good day.